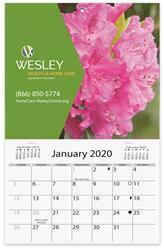 Mini wall calendar with one custom photo/imprint. Calendar pad size is 6" x 4 1/2". A promo with a year's worth of personality! Mini wall calendar with December - December (13 months) calendar printed in black only on white offset. Includes American holidays and moon phases. Standard feature: Calendar pad stapled to bottom of image sheet. Image paper stock: Gloss cover, printed one to full color with your one custom photo/artwork. Production Time (in working days after final proof approval): Please specify one of these storage release/shipping dates: August 29, September 13, October 4, October 18, November 1. Orders received after August 10 will ship 10-15 working days after final proof approval.